As someone who’s constantly on YouTube, there’s one thing I frequently notice. Good audio is just as important if not more important than great video. Think about the last time you watched a video on YouTube where the creator obviously shot the video off a pretty high end DSLR, but decided to use the integrated microphone for the audio. How was that? Probably pretty terrible, right? Yup, and because audio is so important to our computing experience, that’s why today we’ll be reviewing the Audioengine 5+ speakers and the Audioengine D1 DAC. For those unfamliar with Audioengine, Audioengine is a relatively new player in the computer audio industry, but the guys behind the name are definitely not new to the audio industry itself. After spending many decades developing high end studio monitors, the founders of Audioengine decided to create a speaker with studio monitor level quality for the home audience at a reasonable price. Those interested in learning more about Audioengine, be sure to check out their website here. The Audioengine A5+ includes Audioengine’s custom designed 5″ Kevlar woofers, 20mm silk dome tweeters and custom 2.5″ MDF cabinets. It also features a fully custom class AB 50w RMS per channel amplifier so those looking for a high end pair of speakers for their computers won’t need to go out and purchase an additional amplifier just to use those speakers. As music in a computer is digital, you’ll need something to convert the digital signal into an analog signal so speakers such as the Audioengine 5+ can play the audio associated with the signal. This is where a DAC, or Digital Audio Converter, comes into play. 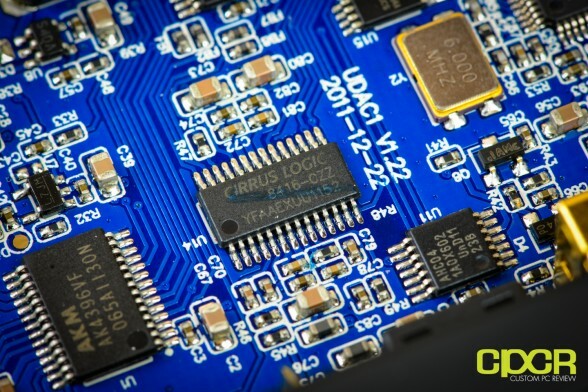 Now most if not all computers have DACs, which come in the form of integrated audio, but these DACs are typically poor quality components that are extremely susceptible to crosstalk and various other electrical signals running through a computer motherboard’s PCB. With the Audioengine D1, the entire device is outside of the computer and connected via USB only, which means less interference from other electrical devices. In addition, Audioengine has dropped in a lot of high end audio processing components such as the well known AKM4395 digital to analog converter and an integrated headphone amp based off the TI NE5532, which is an excellent amp capable of driving higher end, higher resistance headphones as well. 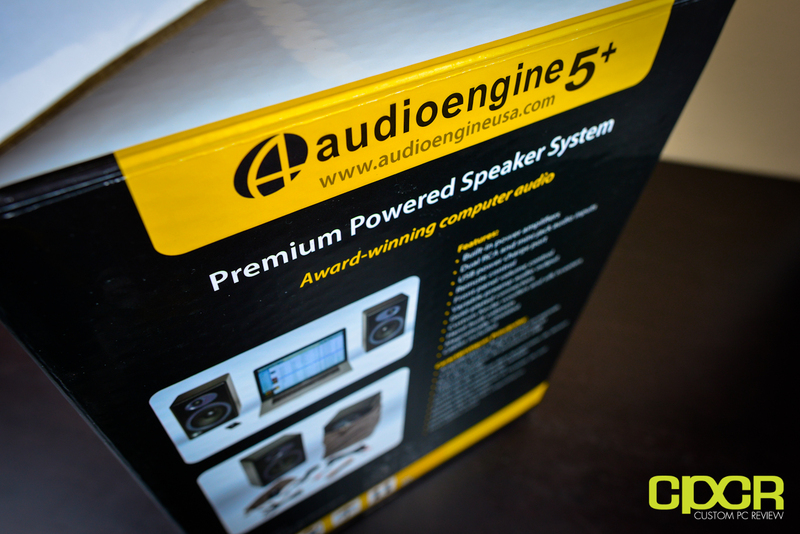 Out of the shipping box, we get the box for the Audioengine 5+. Overall, the box here looks quite good with the black and yellow color scheme along with all the features and product images plastered all over. 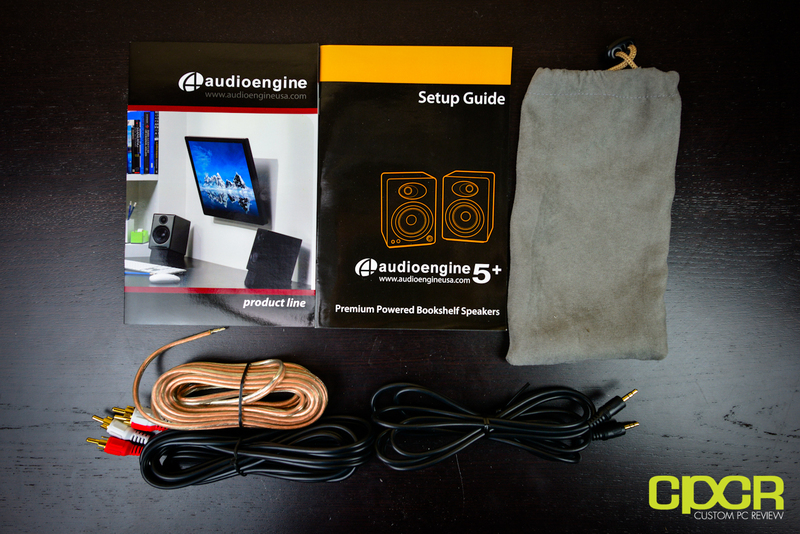 cloth covers for each of the Audioengine A5+ speakers, and a small cloth bag for all the cables. Yeah, they really went all out here. Taking a first look at the speakers themselves, it’s quite apparent that the left speaker here is the “control” speaker while the right speaker is the “satellite” speaker. While the right speaker is void of any controls or indicators, the left speaker contains a volume knob (doubles as a sleep button), a LED indicator (far left white plastic cover), and a IR receiver for the remote control. Each speaker is enclosed in 25mm thick MDF cabinets finished in a matte type finish. Unfortunately they will catch the oil on your hands if you touch them with really oily hands and they are difficult to clean off, so be careful! Each speaker contains one 20mm silk dome tweeter and a 5″ Kevlar woofer. 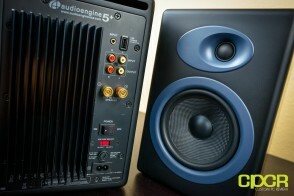 Audioengine uses audiophile-quality, ferro fluid cooled silk dome tweeters with neodymium magnets. Silk tweeters hold up well under high power and the edge-driven design gives very smooth response. The woofers are Kevlar woven glass aramid composite with rubber surrounds. 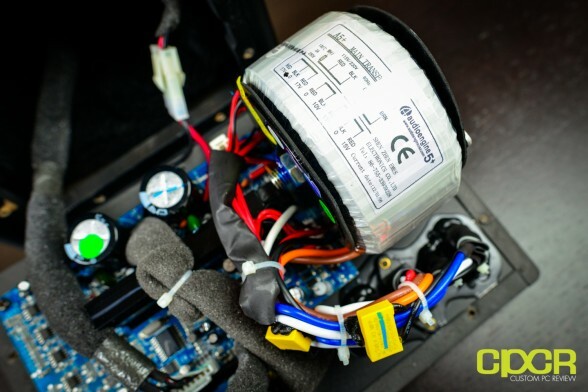 Kevlar is obviously very strong, which means that the woofer retains its shape when being driven at high levels. 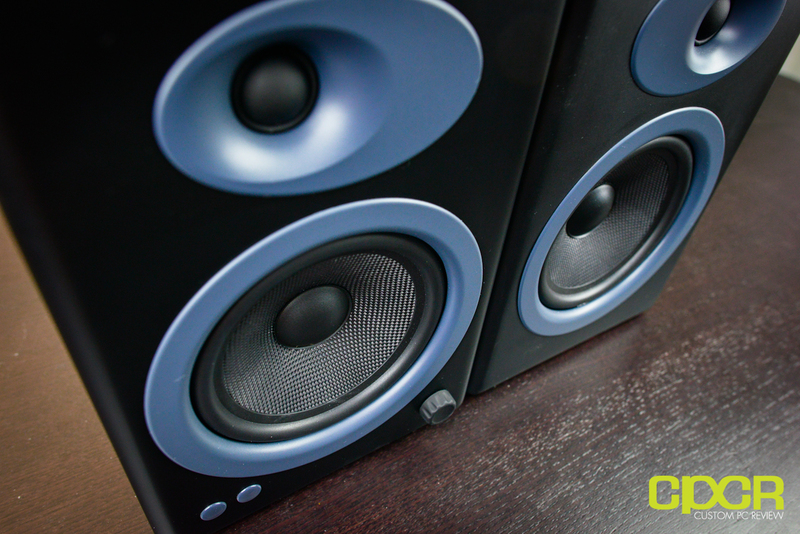 The speaker materials and construction are robust enough to stand up to some serious thrashing, so speaker grills aren’t needed and they will sound and look great after many years of use. 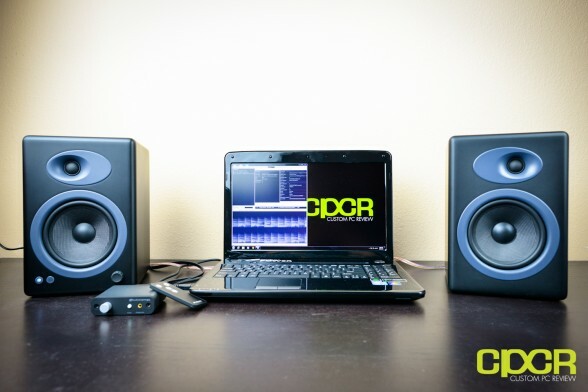 The drivers in the units are shielded as well, so speakers may be used next to monitors or other electronic equipment without catching unwanted interference or noise. Both drivers are directly video shielded and allow the user to place the speakers within a few inches of a video monitor. This shielding also offers protection for hard-drive digital music players. Here’s a look at the rear of the two speakers. It’s a lot more apparent by looking at the back that the left speaker is the “control” speaker. 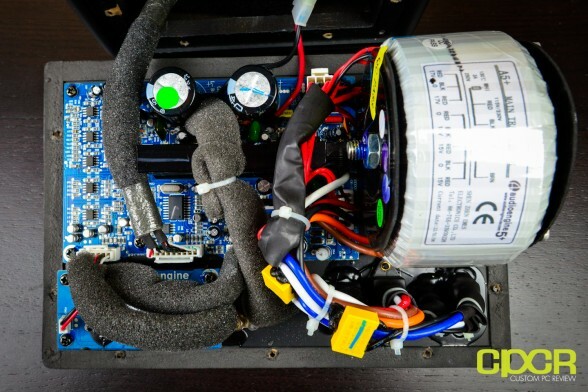 The first thing you’ll notice about the left speaker is that Audioengine has included a giant heatsink to passively cool the amplifier embedded in the left speaker. 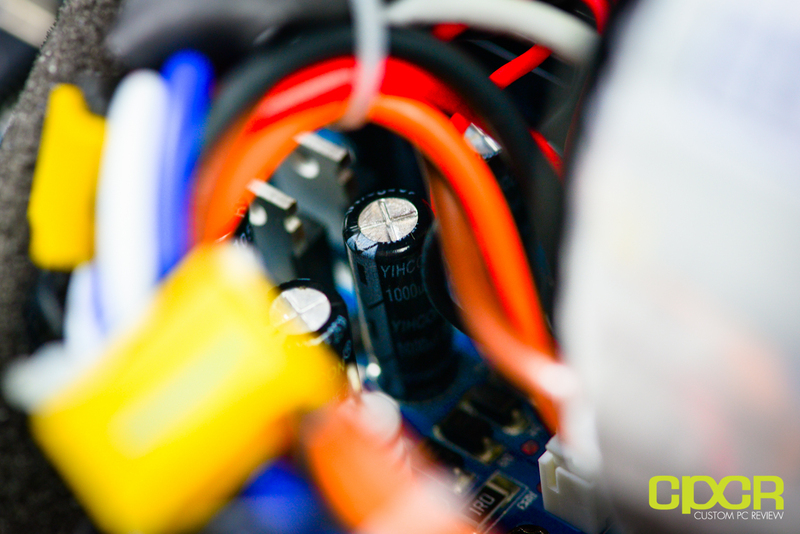 On the right of the heatsink, we get all the connectivity which includes a 3.5mm in, a USB power output (for charging USB devices only! ), RCA in, RCA out, speaker output, power switch, and voltage selection switch. The right speaker is simply a passive speaker and only includes a speaker input. 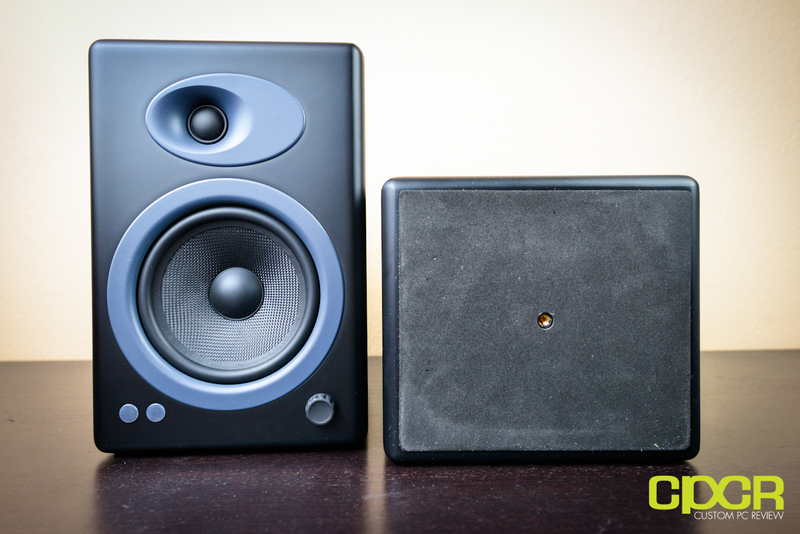 At the top of both speakers, you’ll also notice a large slit, which is used as a port to enhance bass response. 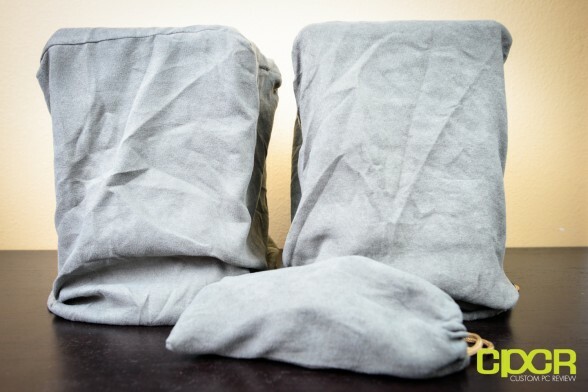 The bottom of each speaker is felt lined to help isolate the speaker and prevent vibrations. In the center of the bottom of each speaker is also a 1/4″ threaded insert for securing the speakers. Be aware, the threading here is only meant to complement other methods of mounting the speakers. The speakers are not designed to be mounted using the 1/4″ insert alone. Here’s a look at the electronics behind the Audioengine 5+. Firs thing you’ll notice here is the huge torroidal transformer used to deliver power into the unit. These transformers are most commonly used in audio applications as they radiate less electrical noise to the rest of the components. Power transformers are a large contributor to the overall audio performance, especially in the low end. Again, no off-the-shelf parts. Audioengine uses gapless core toroidal transformers which have a tighter radiated magnetic field, directly translating to lower noise. They are lighter than standard, lower-cost “EI” transformers and also generate less heat. Here’s a closer look at the PCB. 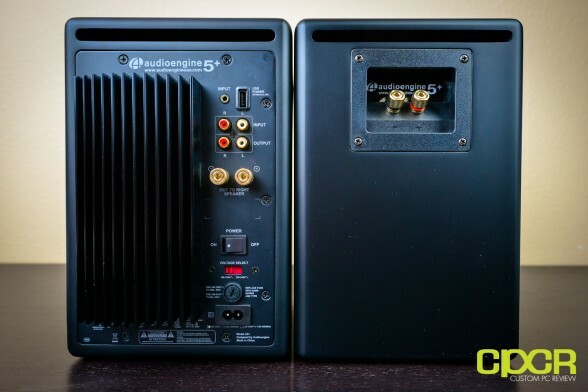 Audioengine has gone with a number of TI N5532 amps. The amplifiers in Audioengine speakers are located in the left speaker and are a conservatively rated analog design. All components are tuned together for each model, which provides a much more efficient system requiring less power than passive speakers and separate amplifiers. Circuit boards for the power and preamp sections are mounted for maximum mechanical shock protection. 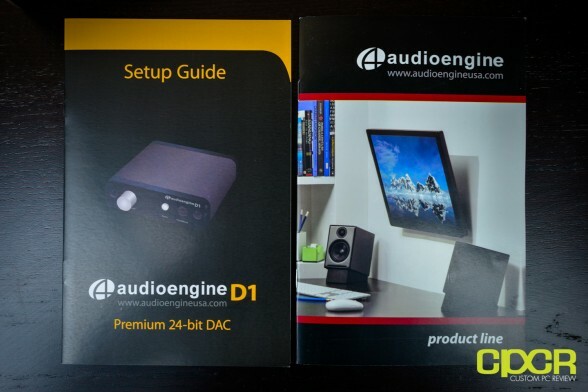 Here’s a look at the Audioengine D1’s packaging. It’s a fairly simple box with all the features plastered right up front. Very similar to the packaging for the Audioengine 5+. Inside, Audioengine includes some documentation with the D1 along with a product catalog. 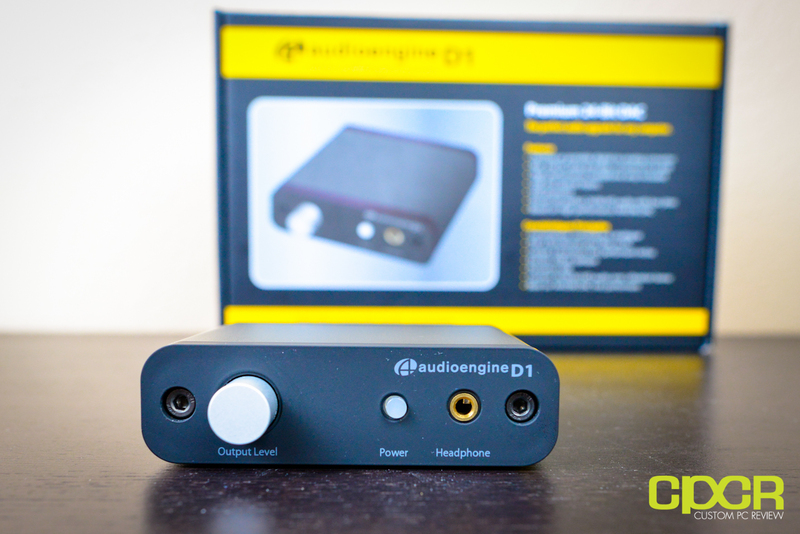 Taking a first look at the Audioengine D1, we can see that it’s a very small, very sleek little device. The entire middle portion of the casing is made of brushed aluminum and the front and back is made of plastic with a soft touch coating. Included is also a small cloth pouch used for storing the Audioengine D1 when not in use or when travelling. The design of the D1 here is fairly simple. The front of the unit includes an output level, a power LED/switch, and a 3.5mm headphone jack. Moving around the back of the unit, we get some RCA output jacks, an optical input as well as a USB input. At the bottom of the unit, we get some information about the device. 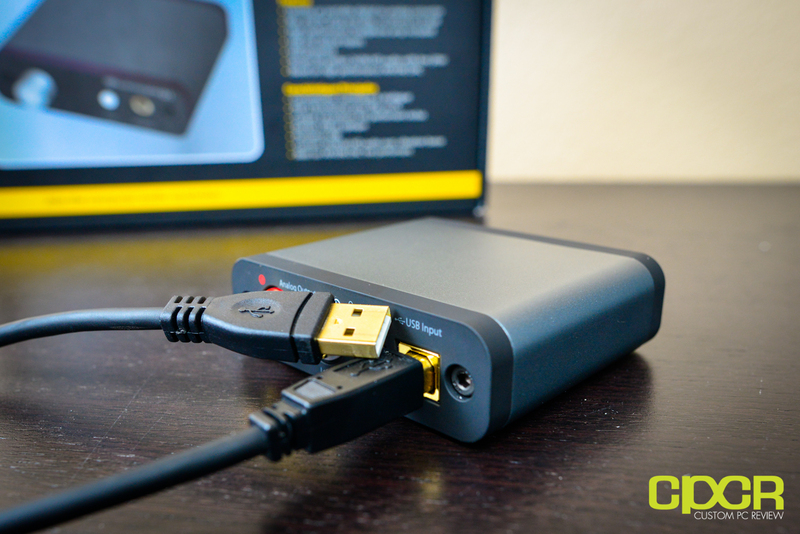 Audioengine has also included a super short 2ft (0.6m) USB cable with the D1 as well. While normally I wouldn’t be too pleased with a cable this short, longer cable runs may degrade signal quality, so I’m not going to give Audioengine too much of a hard time here. The cable is very thick, so it does appear to have some sort of shielding against interference. 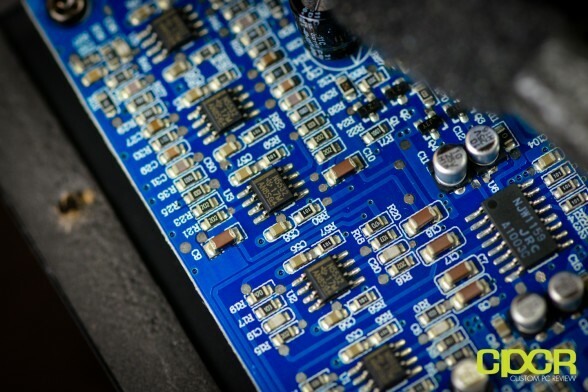 Additionally, the connectors themselves are gold plated as well, which helps increase resistance to corrosion. The Audioengine D1 is fairly easy to open – simply take a torx screwdriver and remove the 4 torx screws at the front and rear of the unit. 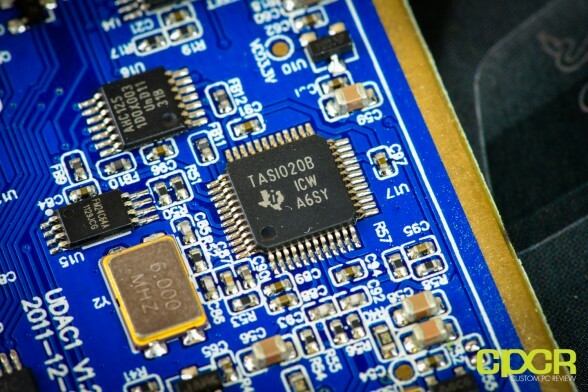 Taking a look at the PCB, we can see that Audioengine has gone with the AK4396 DAC, which is a top of the line 24-Bit/192kHz DAC sporting a SNR of 120dB. 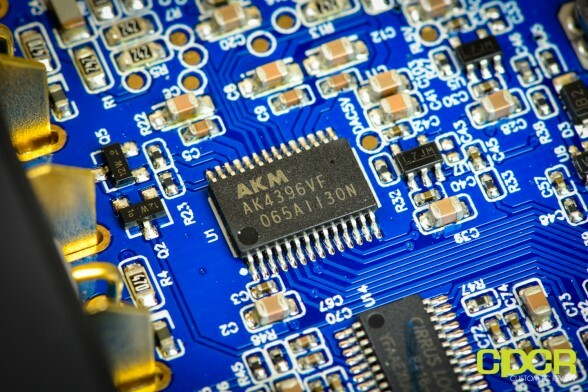 For more information on the AK4396, check out the product page here. 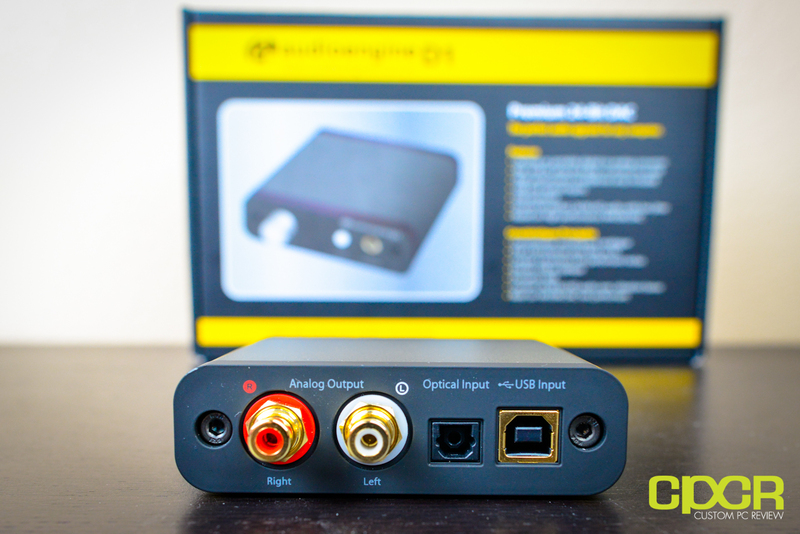 The D1 uses the AK4396 DAC, well regarded for its low noise and high fidelity. 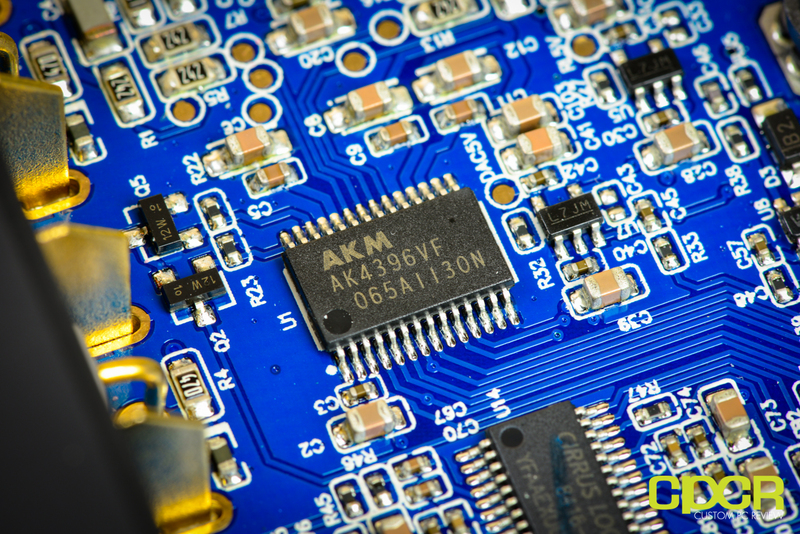 Due to the high signal-to-noise specs of the AK4396 and the added benefit of double redundancy power source conversion and filtering, the D1 presents impressive low noise and low distortion characteristics. In order to drive high end, high impedence headphones, Audioengine has also included the famous JRC 5532 op-amp. What’s interesting here is that Audioengine lists the TI NE5532 op-amp on the spec sheet for the D1, but includes the JRC 5532 instead. The D1 includes a headphone amp based on the TI NE5532 low noise opamp. 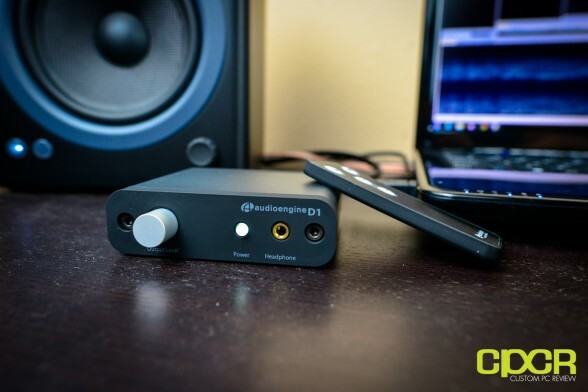 This headphone amp is able to provide low-impedance, high-fidelity audio to a wide range of headphones and supports headphones with impedance as low as 20 ohms. For the USB interface, Audioengine has gone with the TI1020B. Unfortunately, this USB interface is not capable of receiving 24-bit/192kHz signals, so you’ll be limited to 24-bit/96kHz through USB. The D1 utilizes the TI1020B USB controller, widely recognized as a standard for higher-end USB audio products. The D1 is powered directly from the USB bus and USB power is passed through two stages of regulation to ensure high stability and low noise. Since the Audioengine D1 isn’t capable of 24-bit/192kHz over USB, then you might ask, why is it advertised through the product specifications? 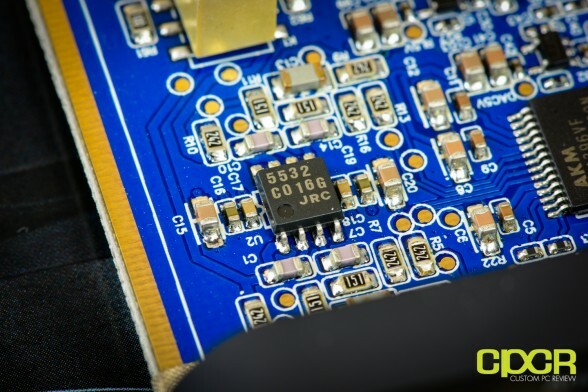 Well, the D1 also includes a Cirrus Logic CS8416 192kHz Digital Audio Interface Receiver, which interfaces with the optical input and is capable of accepting 24-bit/192kHz signals. 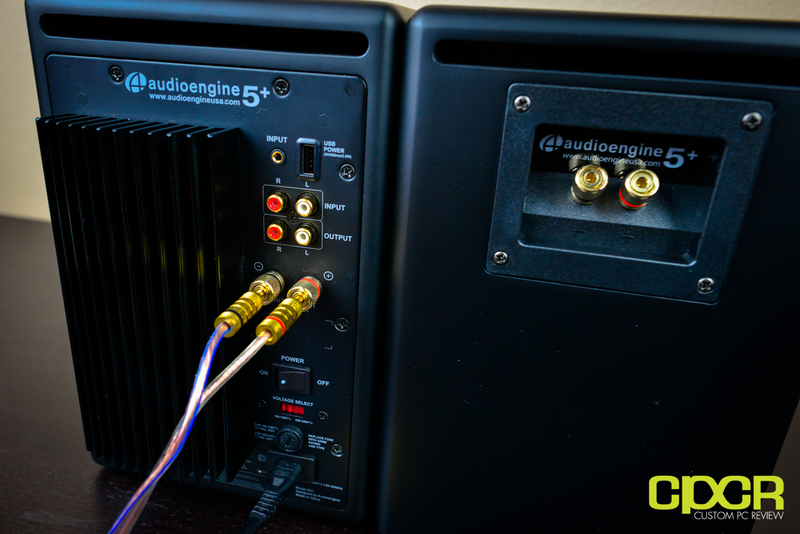 Setting up the Audioengine 5+ along with the Audioengine D1 DAC was overall an easy and painless process. 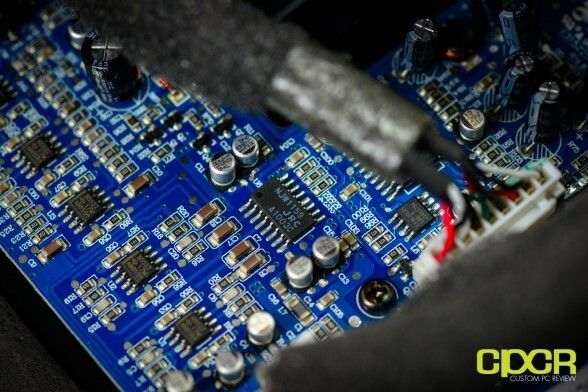 The easiest way to get started is to connect the speaker wire from the speaker wire terminals on the left speaker to the right speaker. Connect any audio output device to either the 3.5mm audio in jack or the RCA audio in jack, plug in the power cable, and the speaker is all ready to go. In order to optimize your listening experience, Audioengine also includes a ton of tips on speaker placement, connectivity options, etc. in the setup guide as well. 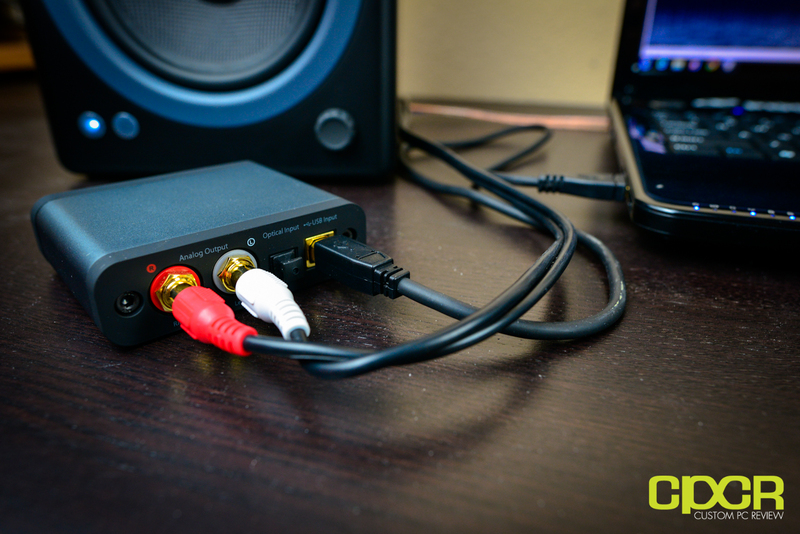 The D1 DAC is connected to the PC using the included USB connector while the connection to the speaker can either be through the RCA outputs in the back or via the 3.5mm jack in the front. For testing, I opted to go through the RCA outputs in the back in order to be able to also enjoy music through the headphones during nighttime listening. Audioengine includes a 12.3 ft speaker wire (16AWG) which can be attached bare wire to the rear of the speaker, but since I had a couple extra banana plugs available, I installed them onto the speaker wire and they ended up working perfectly fine with the Audioengine 5+. 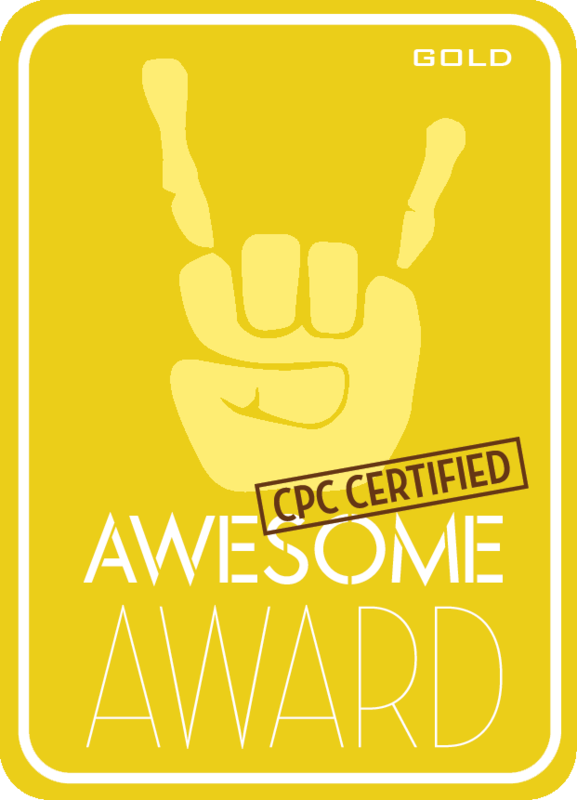 Thumbs up to Audioengine for using a lot of non-proprietary stuff! As usual with my audio product reviews, I tested the Audioengine 5+ quite extensively in a variety of different movie and gaming scenarios. For gaming, spent most of my time playing a lot of Battlefield 3 as well as the newly released Counter Strike: Global Offensive (CS: GO). In both games I had an extremely good experience with these speakers as they delivered crystal clear vocals and a surprisingly large soundstage, which really helps give games that three dimensional feel. Even during gameplay I was able to hear some minute details in the sound with the Audioengine 5+ that I never noticed before. Most computer speakers, even the higher end ones from Logitech or Klipsch are tuned very heavily towards the bass and a lot of sound in the mid section disappear in the process. With games like Battlefield 3 where there the developers put a ton of effort into small details in the audio such as birds, wind noise, etc., being able to hear these sounds makes the game a much more immersive experience. One thing I did notice when using these speakers is that it’s very important to get at least about 4 feet of distance between the speakers and ideally according to the manual about 6 feet. Typically, most people place computer speakers around 2-3 feet apart and at least with the Audioengine 5+, there’s a huge and very noticeable difference in the sound stage and three dimensional feel of the movie or game when doing so. It’s also very important to give the speakers at least 6 inches from the wall behind them and to remove any obstacles in the way as this will help enhance the bass response. As with gaming, I noticed a similar experience with movies as well. One of the most memorable movies I watched during the testing period was the new movie, Battleship, which for a huge nerd like me was a full 131 minutes of pure audio bliss. The Blu-Ray edition’s lossless DTS-HD Master Audio 5.1 track was stunning even though I had stepped the track down to 2.0 for the Audioengine 5+ speakers. The 5+ handled the audio very well giving each splash, each shot of the cannon, and each fighter jet flying by a sense of complete and utter realism. Vocal clarity was amazing here as well, which gave me the feeling that I was right there on the bridge as Lt Alex Hopper (Taylor Kitsch) and Cpt Nagata (Tadanobu Asano) were making plans to take out the alien vessel. That said, one thing I really missed the first time I watched Battleship was the complete lack of earth shattering bass that would be accompanied by most 2.1 computer speakers out there. However, Audioengine does give you the option of connecting the Audioengine S8 or any 3rd party subwoofer that accepts RCA inputs (practically everything). In my case, I dropped in an Emotiva Ultra Sub 12 and the result was nothing short of spectacular. So good in fact, that my 20 minute “re-test” of Battleship’s epic USS Missouri vs alien spaceship battle turned into a “re-test” of the entire movie. For those who purcahse the Audioengine 5+ and expect to spend a ton of time gaming or watching movies, I’d very highly recommend picking up a subwoofer such as the Audioengine S8 (not tested personally) or the Emotiva X-Ref 12 (successor to the Emotiva Ultra Sub 12 tested today) for that extra kick in the low end. 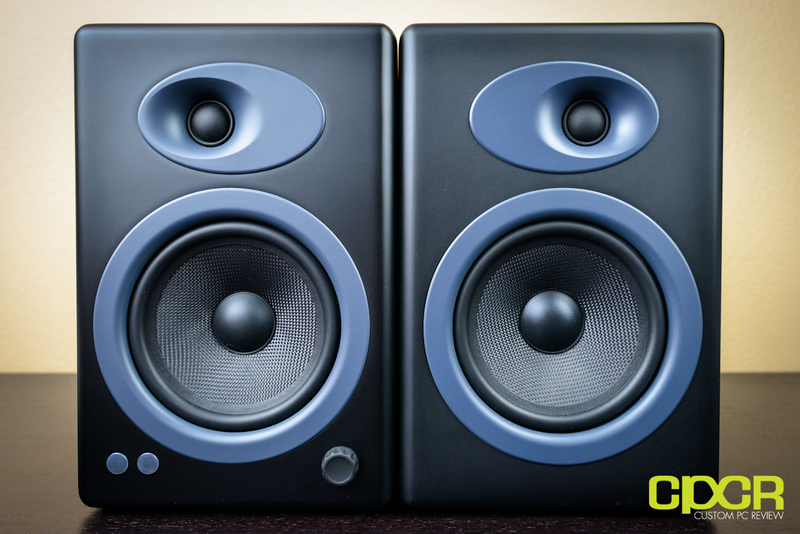 While the 5+ speakers can produce clean and tight “musical” bass, it simply doesn’t give you that same earth rumbling effect that you’d get from a dedicated subwoofer. Next up I also tested music with the entire setup, and similar to my testing with movies and gaming, I was extremely pleased here. Unlike a reference monitor, the Audioengine 5+ is tuned to slightly favor bass, which may be a bit undeseirable to those who are really looking for a totally flat response. The highs on the other hand are a bit bright and sound a bit “raw” while the mids seem a bit overpowered at first, but after about a bit of breaking in (~10-20 hours or so for me, Audioengine recommends 30-50 hours), it does go away. After the A5’s are broken in, the speakers start giving you rich and warm mids, which when coupled with crystal clear vocals is especially suited for music with mid/high to high end vocals such as Adele’s Rolling in the Deep or AC/DC’s Thunderstruck. Those who enjoy piano music will find the clarity of these speakers stunning as well, as I sat there feeling there was a grand piano playing George Winston’s Variations on Canon right in my room! Additionally, since these speakers are tuned for a bit more bass I found that “party” music and soundtracks are especially good with these speakers as well. Stuff from Usher and Two Steps from Hell sounded exceptionally good, and coupled a powerful subwoofer for that sub 50Hz response I found myself dancing in my seat. In addition to the speakers, I also did some listening tests with the Audioengine D1 DAC in all of these scenarios above and I found performance with this little unit to be great as well. The biggest thing you’ll notice about the D1 DAC is that it was able to clean up the electrical noise (hissing and humming) especially in comparison to the onboard sound on both my desktop (Realtek ALC898) as well as the audio on my laptop (Realtek ALC269). This was especially annoying when using my Ultimate Ears TripleFi 10, which is an extremely sensitive pair of IEMs (in ear monitors). Audioengine claims that the D1 can be used with any headphones with a minimum of 20 ohms resistance, but I didn’t find that the case on the Ultimate Ears TripleFi 10, which is rated at 32 ohms. Music came out distorted and there was slight hissing going on in the background, which almost sounded a bit worse than onboard sound on my computer. However, I did try plugging in the airline attenuator, which gives the headphones ~100 ohms additional resistance and that worked absolute magic. The hissing went away, and the audio became crisp and clear. I spent some time switching back and fourth between my iPhone 4S and the Audioengine D1 with the TripleFi 10 and the iPhone 4S doesn’t even compare to the Audioengine D1. Music simply sounded much more lively and the imaging felt a lot more realistic whereas music coming off the iPhone 4S sounded a bit dull and fake, not to mention the slight hissing as well. With both the Ultimate Ears TripleFi 10 and the Audioengine 5+ speakers, I found that the D1 DAC was able to output a fairly balanced response, which personally for me is ideal for music. Unfortunately, both the Audioengine 5+ and the Ultimate Ears TripleFi 10 are both slightly colored for bass, so I wasn’t able to really accurately judge if it’s the DAC that was giving the bass and low mids the slight kick. Either way, the music sounded amazing. Alright, so for those of you reading this review and you haven’t really gotten the message yet, these Audioengine 5+ speakers are awesome. I think this is one of those all around speakers that’ll really do the trick for everything. Yeah, it would be better if you could grab a pair of totally flat monitor speakers for music if you’re into that type of sound signature, but usually with a computer, you need a pair of speakers that can do it all, and I think the Audioengine 5+ is that pair of speakers. Crisp and clear treble, warm mids, a fairly powerful bass response, huge soundstage, and a huge sweet spot. See why I think it’s so awesome? Yeah. That said, it’s a smidge heavy on the bass and for some of you, this might be a deal breaker, but considering most people spend tons of time on their computer for stuff like games and movies that need some low end, I’m not going to fault Audioengine for giving the 5+ a bit of extra oomph down there. Well, not so much oomph as the bass is more musical than the usual 1 note booms you hear off something like my old Logitech Z-2300. In terms of appearance, I really love the simple and classy look of speakers. The kevlar woofer here looks fantastic, and the matte finished black cabinet fits in with most computer decor. That said, those who have a full white theme (Apple people, yes I’m pointing at you) can opt for the white edition of the Audioengine 5+ and those who prefer a more exotic look can opt for the bamboo edition as well. One thing I’m not a huge fan of though is the off center tweeter. Personally, I think it looks a bit funky and unbalanced as I’d like to see it placed in the middle, but I guess some people like the design so it’s not a huge huge deal. These things still look amazing. Connectivity and features is also something that’s really impressive. USB charging port, 3.5mm jack, RCA inputs, RCA outputs. Nuff said. Has everything you need and a bit more. 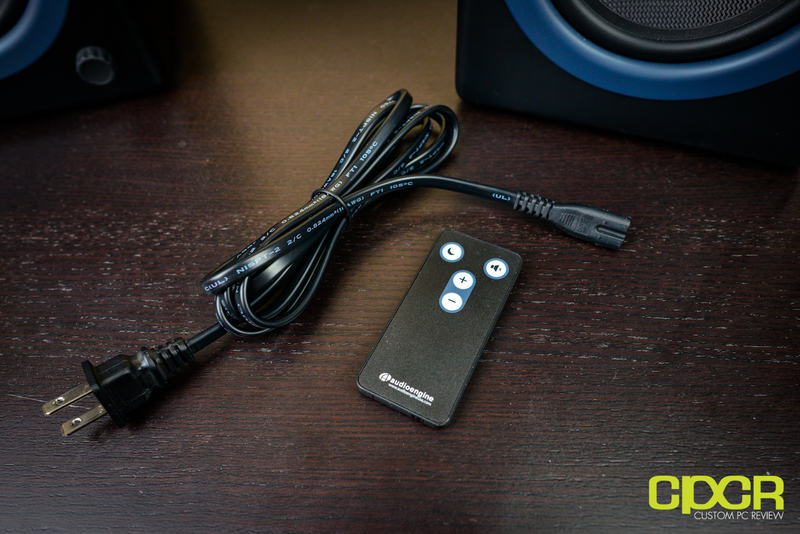 Audioengine even includes little covers and a full accessory package, which includes all the cables you’ll need to get going, and a remote control. Notice how there’s a lot of “a little bit more” here. It kinda feels like buying a Blu-Ray player to find an HDMI cable included. Yep, just that little bit more. 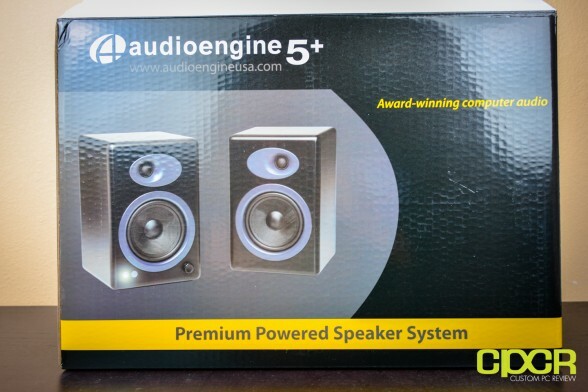 Pricing on the Audioengine 5+ is currently $399.00 on Amazon, so it’s definitely one of the most expensive computer speakers out there. 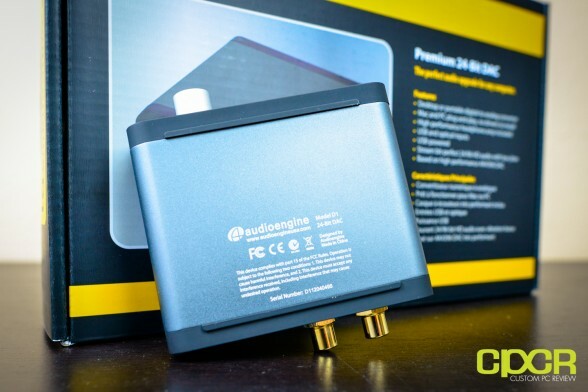 If you throw in a subwoofer such as the Audioengine S8 and a quality DAC like the Audioengine D1, you’re definitely looking at around $1,000. That said, I think the sound quality with these are amazing and with its feature/accessory package, it’s well worth the $400. The thing about speakers is that unlike other computer gear such as motherboards, CPUs, GPUs, etc. that only last you 6 to 18 months, high quality speakers will easily last you 10 years or more if you treat them with care, so $40 (or less) a year for 10 years (or more) of audio bliss? Totally worth it. Speaking of reliability though, one thing I’m not pleased about with these speakers is Audioengine’s choice in using cheap Chinese capacitors in the speaker’s amp. I was really, really, really tempted to deduct a huge point for this, but I haven’t had issues with the Audioengine 5+ speakers over the time I’ve tested them, and overall reliability across user reviews on Amazon seem pretty good. 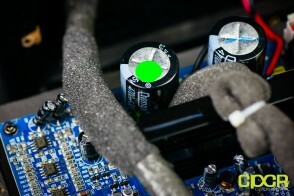 However, I’m not convinced at all that ChengX or Yihcon capacitors should even belong in a $400 pair of speakers. Forget about the MM-1, forget about the Companion 5, forget about the BeoLab 4. If you’re looking for the best pair of all around speakers for your computer, this is it. Special thanks to Audioengine for making this review possible. The Audioengine D1 DAC is currently available on Amazon. 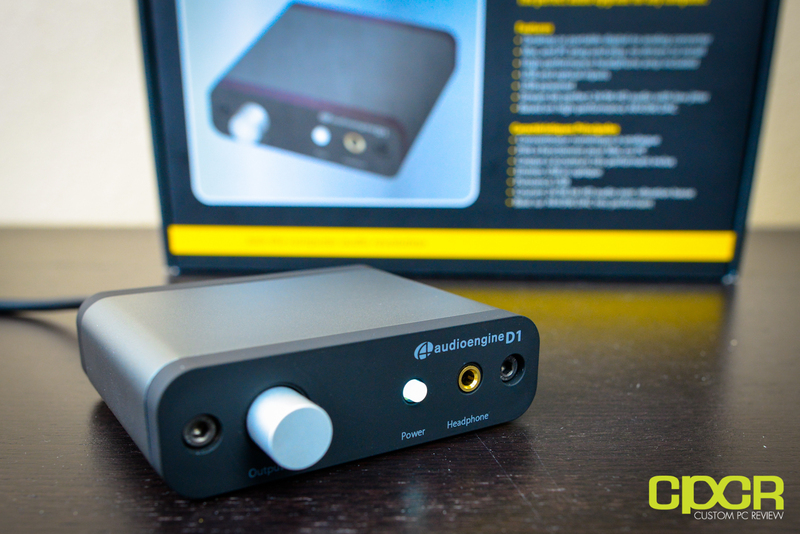 With the Audioengine 5+ Speakers out of the way, let’s talk about the Audioengine D1 DAC for a moment. Performance here was fairly good. Audio sounded a tad bit more rich and lifelike, but most importantly, the DAC was able to much better isolate electrical noise, which is what most people will immediately notice here. There really isn’t anything more annoying than a load of electrical noise when hooking up sensitive headphones to a computer. One thing I’d like to mention about the DAC though is that if you’re planning on using a pair of headphones with the D1, you’ll definitely want a higher end pair of headphones with higher resistance to take full advantage of the D1. Just for giggles I plugged in a pair of those famous headphones that come bundled with the iPhone 4S to both the Audioengine D1 and my desktop’s onboard sound and I found zero difference. In fact, I thought they sounded slightly worse for some reason and the hissing was more pronounced as well. Definitely get a quality 50 ohm+ or even better 250 ohm+ high end pair of headphones to go with the D1. Appearance and formfactor here was great as well and the device is definitely small enough for those who want to take it on the go. Without something like this, your high end 250 ohm+ headphones would be pretty useless when plugged into a laptop, but with the D1, you can now take your favorite pair of headphones on the go. 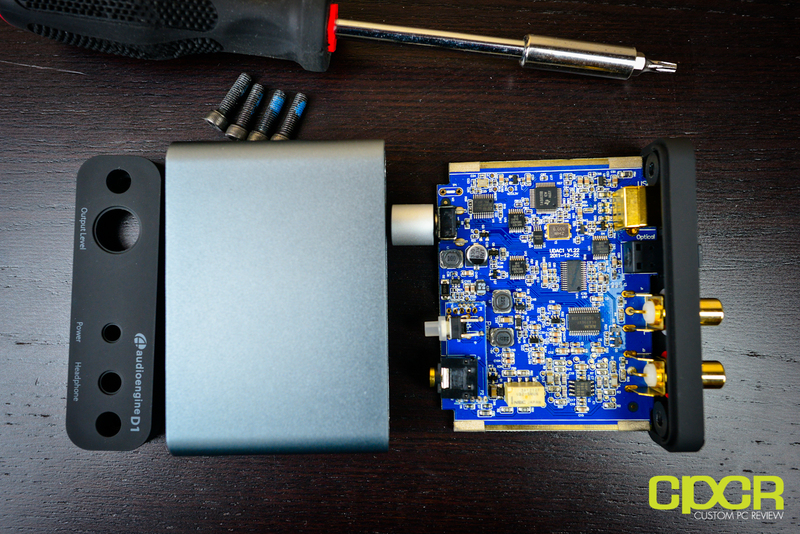 For people looking for a DAC + headphone amp for this purpose, I think the Audioengine D1 is going to be worth every penny. 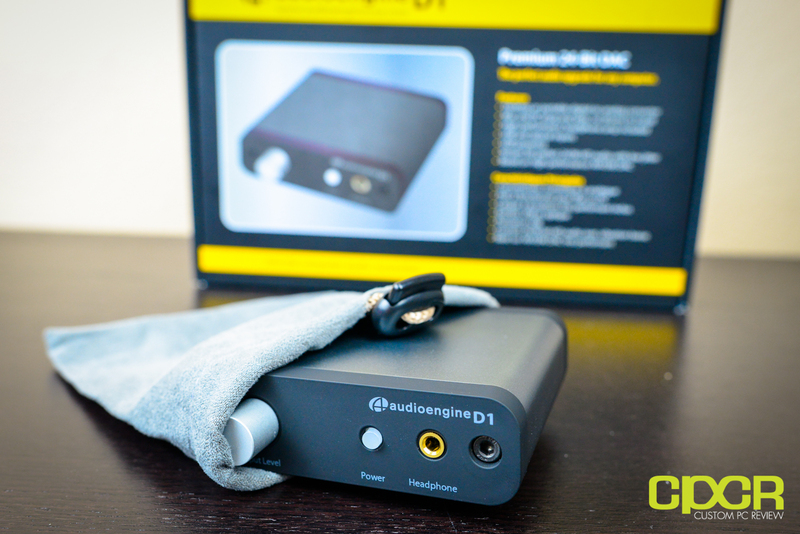 Additionally, like what we saw with the Audioengine 5+, Audioengine includes a small cloth pouch with the Audioengine D1 for protection on the go. Just a little bit more. In terms of connectivity and features, you’re getting optical in, and usb for the inputs while you’ll also get RCA and 3.5mm out for the outputs. For a device that fits into the palm of my hand, this is amazing. Additionally, you’ll also be getting 24 bit 192kHz audio as well, so those who purchase ultra high end Blu-Rays will be able to enjoy ultra high quality audio. Personally, I can’t really tell the difference between 16 bit 44kHz audio and 24 bit 96kHz audio let alone 24 bit 192kHz audio, but the feature is there nonetheless, so if you can, more power to you. Pricing on the Audioengine D1 is currently $169.00 on Amazon, so it’s actually not too expensive for a high quality DAC. That said, those looking for an audio upgrade should definitely upgrade their speakers or headphones prior to making an upgrade on the DAC. 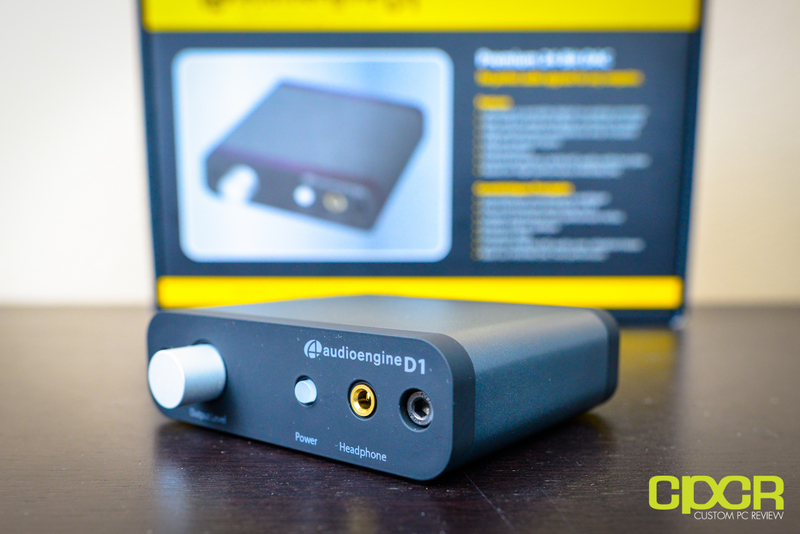 However, if you already have some high end headphones or you specifically want the optical input on the Audioengine D1, the Audioengine D1 is an excellent choice for the price. 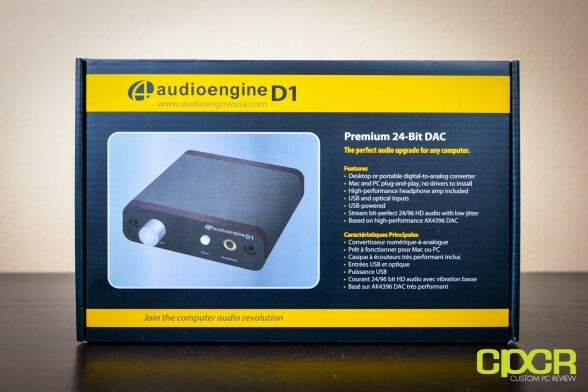 Those looking for a portable DAC + amp combo will find the Audioengine D1 an excellent performer with tons of connectivity at a reasonable price. They ARE heavy on bass to the point the mids are a little behind the bass making some voices seem to also sit behind the bass. That drove me nuts so mine are going back. I have owned a pair of A5+ speakers and the S8 subwoofer for several months now and I am still amazed by them everytime I watch a movie, game or listen to music. Simply the best. Awesome review — I love these A5+s. Didn’t realize they fit banana plugs, and when I bought some the plugs don’t seem to go in all the way. Is that how they are supposed to be? Or can you recommend which kind of banana plugs you used? Thanks! Thanks! Yup. I think that’s how it’s supposed to be. The plug sticks out a little bit on the end. As long as they’re helping make a good connection between the wire and the speaker I think that’s all that really matters. Nice review in general, except the last paragraph with all this nonsense about cable length, gold plating and signal quality degradation when speaking about a DIGITAL connection such as USB. Assuming you’re talking about the D1’s cable, I should’ve probably clarified. By signal quality I meant the signal as a whole rather than the actual data that’s going through. Yes, a digital signal will be accurate from point A to point B thanks to USB’s built in error checking, but audio is also dependent on latency. If the latency is too high, the packet is dropped. This causes stuttering. In USB 1.1’s case (the controller onboard the D1), that latency is 18nsec. Longer cable runs increases latency and unshielded cables have the potential of more errors if there’s a big source of interference somewhere. Max spec on USB 1.1 is 3 meters or ~9.8ft. As for gold plating, it prevents corrosion. If you live in a dry, desert environment, it’s not a huge deal, but there are many places in the world with high humidity or salt content. This can cause signal problems same way corrosion on batteries will cause it to stop functioning. Of course, if you live in a nice dry environment and you aren’t running tons of electrical or EMI emitting devices next to your USB cable, then sure. Cheap $0.99 cables are fine. I’ve used standard cheapo Chinese made 6ft USB cable without issues. You are making it sound like unless you live in the middle of the dessert with 0% humidity and no other electronic device within a mile, you will have all sorts of issues with corrosion and interference. In practice, though, it’s quite the opposite – you have to be living for years in the Amazon rain-forest, or running an open patio bar on an ocean cruise ship, or trying to use the DAC in the Large Hardon Collider while it’s working at full power in order to be *rightfully* concerned about any of these issues. 99.9% of general users will never be in a situation like this. As far as stuttering with long USB cables – have you ever heard it? I guess no. USB protocol takes care of this. Either the connection is there and is stable enough to *guarantee* data transfer (no dropped packets, as you said, this is not UDP), or no connection at all. Again, while you speak in theory, I tested this in practice, although with a different DAC – I chained a few of those cheap USB cables and extenders and did not hear any stutter or noise (and I didn’t expect any). When I put one too many cables in the chain, the DAC simply stopped being recognized as a device by the computer and of course stopped playing. But, as long as it was being recognized, it played just fine. I’m assuming the line you’re referring to in my review is “…longer cable runs may degrade signal quality…” To my knowledge what that means is that there is the possibility something like that could happen. Is that true? Yes. If the signal is so badly degraded that the system won’t even recognize the device, then yeah that’s a form of signal degradation. Does it have to happen? No. Does it have to mean it’ll likely happen? No. However, if one of my readers decide to throw a 12ft or 16ft USB cable (no extenders obviously) on the D1 and it doesn’t work or it barely works, would that be good information to know? I hope so. Next sentence. “The cable is very thick, so it does appear to have some sort of shielding against interference.” I’m pointing out the appearance of the cable that it might have shielding and I’m also pointing out what shielding is supposed to do. I don’t know how you interpreted that as me saying you will get interference if you don’t use a cable like this. However, if it does happen that one of my thousands of readers is sitting next to an unshielded LHC with their $0.99 unshielded cable, then well then they know why it’s not working right. The final line you might be referring to is “…helps increase resistance to corrosion…” Does gold do that? Yes. Helps increase resistance to corrosion. An interpretation that not having gold means it will corrode or that it will likely corrode would be faulty logic on the reader’s part. Look up USB corrosion, cable corrosion, etc. It happens. Quite often. Lots of people live near large bodies of salt water. (Hong Kong, Taiwan, Vietnam, Thailand, Phillipines, Malaysia, Indonesia, etc. and that’s only Asia alone). TL;DR I’m nowhere near suggesting that it’s imperative you absolutely MUST USE the stock Audioengine cable or that no other cable will suffice. I’m merely saying that this cable has certain features that some, not all people MAY find useful. That’s it. If you didn’t read it like that, then I must’ve miswrote something or you misread it. I am thinking about these A5+’s for use with my computer and gaming consoles. I figured I can do 3.5mm from PC to the RCA on the speakers and then I have another 3.5m source (game consoles from HDMI switch) that would go to the 3.5mm input on the speakers… but another part of me thinks that I should also buy the Audioengine DAC so then I could go optical from my consoles and USB from my pc… would that work? I am trying to visualize how the DAC would work…sometimes I like to use headphones when listening to my PC to not disturb others, so could I use the DAC to control the volume on either the A5’s or headphones (in which I would have to mute the A5’s somehow or just turn them off)? What should the volume be for the D1? right now i have it at Max? In my testing, the volume of the D1 doesn’t seem to matter too much as long as it’s not 0 or something. I typically set it to 75%, but that’s more habit from other DACs and amps that I own.